Hey! This is my first review of an ITG product on the blog. I typically don't review ITG because I prefer to purchase NHL licensed products, but ITG Decades 1980s looked like so much fun... I had to try one out for myself! Here's my review. Well, actually there is no base card design for this product. 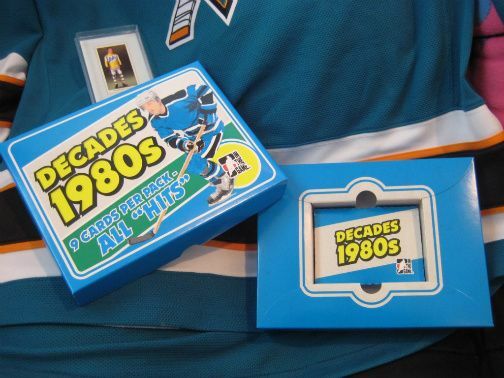 Decades 1980s is a product that features only inserts, game-used cards, and autographs. ITG has really slimmed down this product to give collectors only what they really want... the hits! I think this approach is great as long as there are other full sets with base cards in a company's product line-up. 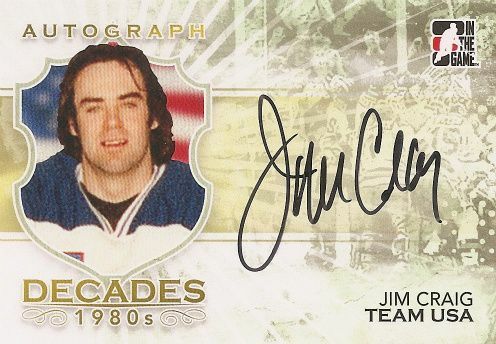 Having a set like this is a fun way to offer collectors a concentrated amount of hits and put it in a sweet little package that reflects the era of hockey that it represents. Since there is no base set to talk about here, I would like to mention a little bit about the packaging of Decades 1980s. The cards come in a retro looking boxed set. Its slightly faded colors, fonts, and artwork all scream 1980s. The package looks like it could have come from 30 years ago. It really looks great and I find that when I see them, I just want to rip them all open and see what's inside. When you open the package you do not see a 'pack' of cards in the usual foil wrapper. ITG has decided to put the cards in a small two piece plastic box - definitely an interesting way to get the cards, but it works just fine. Within the box you get 3 insert cards, 3 game-used cards, and 3 autographed cards. This is what Decades 1980s is all about. When you first open the small plastic box up you are presented with your first 3 insert cards. The first insert card is from the 100 years of hockey card collecting set. This set spans many of ITG's products this year, and this is a continuation of that set. These cards are not 80's themed, but they are nice to look at and are great if you are trying to collect them all from across the different ITG products. 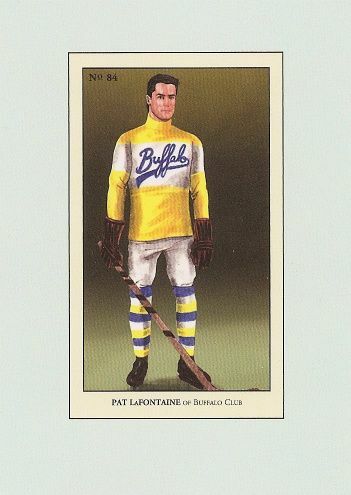 The one I got was Pat LaFontaine. It's a very nice very retro design. I can see why many collectors would go for these. The next two non-memorabilia insert cards are 80's themed. 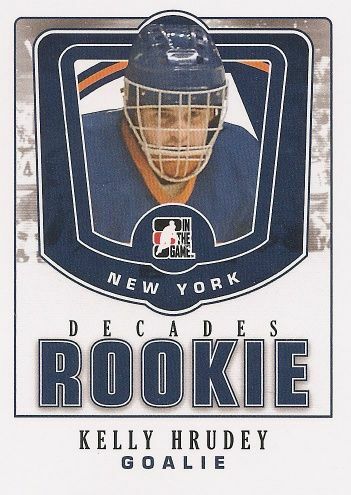 The insert sets feature 'faux' rookie cards like the Kelly Hrudey at the top of this post and cards like the one below featuring players and teams from the 80's. I really enjoyed these inserts because the Topps/OPC cards of the 80's didn't have many inserts. The inserts that ITG put in feature a rich write up of 80's hockey history on the backs. 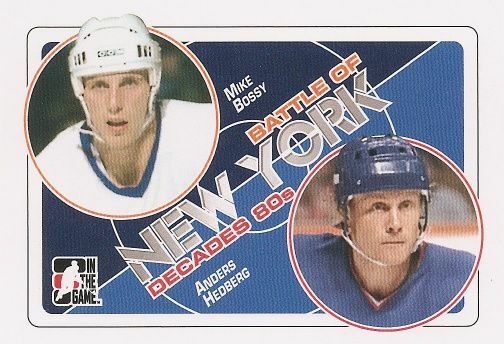 I primarily watched hockey during the 90's so getting to read about some of the players in the 80's on the backs of these cards was a great little history lesson for me. After the first three inserts come the game-use cards. ITG really shines in the game-used department. I received three game-used jersey cards in my box. Each of the three jersey cards featured a good-sized chunk of game-used jersey. ITG specifies on the back that the pieces of jersey come from actual game-used jerseys as opposed to an event worn jersey piece. It's really nice to know that the pieces of cloth on the cards were from an actual game. The cards themselves have a good, solid look to them. 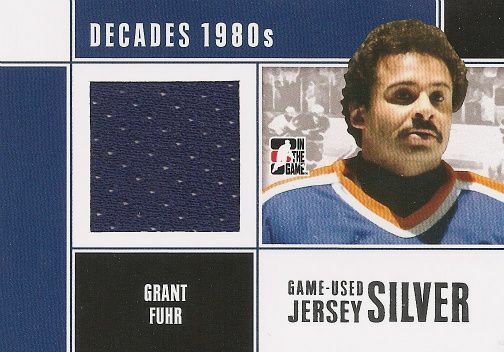 This Grant Fuhr card above is very clean and straightforward - the colors are of the team he is pictured in. It's definitely a functional card, but the 80's were all about doing things 'over the top' so I wish ITG would have chosen a bit more of a radical design than this. No, there definitely nothing wrong with the design, but it could be snazzier. One good example I can think of to compare are the Throwback Treads from 10/11 SPx... take a look at those to see what I mean. 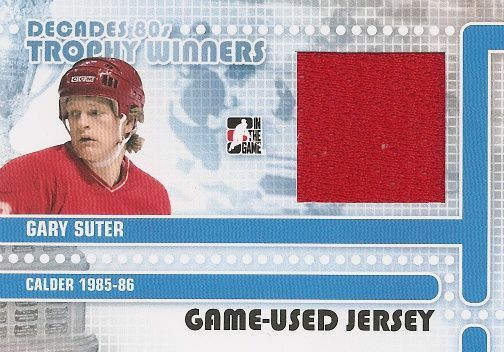 This jersey card of Gary Suter is a little bit better in terms of a 'fun' design. I like the lines that traverse the surface of the card as well as the little white dots around them. A little Pac-Man influence, yeah? Lastly, you get your three autographed cards. The wonderful thing about these are that they are hard signed, non-sticker autographs - definitely worth the price of admission here! They are sweet! Just like knowing the jersey swatches come from actual games, it's (and I'll use and 80's term here) rad to know that the player on the card actually held the card and signed his name on it. The cards are very nicely done. They look pretty nice, but just as with some of the jersey cards, the design could have a bit more pop to it. Like before, definitely not a bad design, but I am left wanting a little more from that aspect of the card. Many of the ITG autograph cards have similar elements to them. I'm not sure if I would call that consistency or monotony... I'll just say consistency for now. All in all, ITG's Decades 1980s is a very fun product to open. Anyone around during the 80's should definitely pick up a box or five of these. ITG has giving us a very fun product to open. And I've seen A LOT of people open this product. I'm sure it'll sell out soon, if not already. The design of the product (aside from the 100 years of collecting cards) are definitely 80's inspired. I would have liked to have seen a bit more risk taken with the designs, but they are still very solid and look good. In terms of memorabilia, ITG always hits a home-run. The jersey swatches on their regular memorabilia cards are a very generous size and are guaranteed to be from actual games. The autographs featured here are hard signed and there are definitely notable players to pick up in this set (Team USA!!!). So, do yourself a favor and get some of this product. It's a great product to rip into and see the old school goodness. Check out my break of ITG Decades 1980s in this video below! Thanks to Chris from D & P Sports cards in Sacramento, CA for helping me shoot the video.